The photo above is of an F/A-18C Hornet breaking the sound barrier. 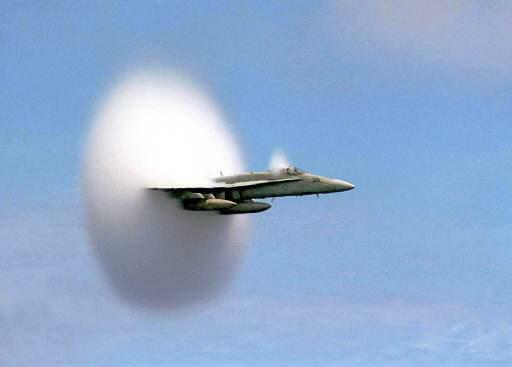 Below is a video of a different jet - an F-14 Tomcat - breaking the sound barrier. If you watch closely, you'll see the nose of the jet dip down as it passes the carrier deck. The shock wave forming on the wing changes the center of pressure and thus the aerodynamic center of the airfoil. This creates a pitch down moment until the entire airfoil is supersonic.